Panini are Italian sandwiches. 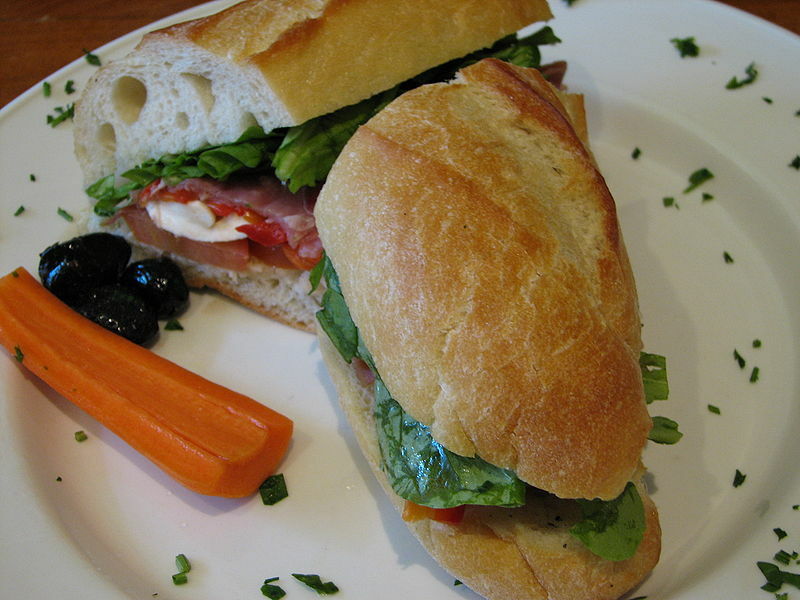 In Italy, a panino is customarily made from a small roll or loaf of bread, typically a ciabatta or a rosetta. The loaf is cut horizontally and filled with salami, ham, cheese, mortadella or other food, and sometimes served hot after having been pressed in a grill. Left: Italian sandwich made with an un-grilled panino, prosciutto, arugula (rocket), and bocconcini. A toasted panino, colloquially called "toast" by Italians, is made out of two vertical slices of pane in cassetta almost invariably filled with prosciutto and a few of slices of processed cheese, grilled in a sandwich press. In Central Italy, there is a popular version of panino which is filled with porchetta, i.e. slices of roasted pork. It is traditionally served without any kind of sauce or topping. In the United States and the UK, panini are typically grilled or toasted and invariably contain cheese. The word panino is Italian for "small bread roll"; its plural form is panini. The word is the diminutive form of pane ("bread").